For more than six decades, Kilroy Realty Corporation has been a leader in West Coast commercial real estate markets - providing services to a diverse array of industries spanning the coast from Seattle to San Diego. 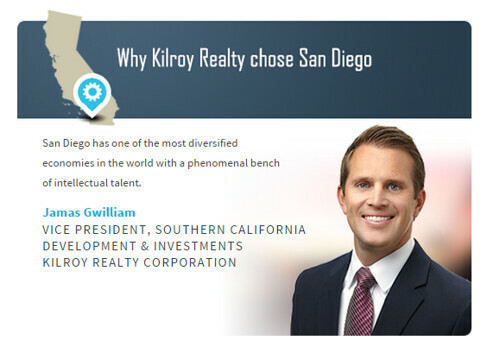 This week Jamas Gwilliam, vice president of Southern California Development and Investments, elaborates on what the San Diego market means to Kilroy Realty. We are committed to creating collaborative, sustainable, highly-amenitized work environments and improving the quality of life in the communities we are a part of. We are proud to work with some of the most innovative companies in technology, engineering, health care, biotechnology, entertainment and professional services. Kilroy Realty was named #1 Landlord in North America by the Global Real Estate Sustainability Benchmark in 2014 across all asset classes and #5 in the world. Kilroy’s San Diego office, Kilroy Centre Del Mar was most recently awarded The International Office Building of the Year (TOBY) award in July 2015 which is a testament to the quality of operations the company stands for. We are passionate about being environmentally responsible and improving the quality of life throughout the West Coast: Kilroy is the major donor for the Rozalia Project for a Cleaner Ocean, participating in furthering their mission of marine preservation and education. San Diego has one of the most diversified economies in the world with a phenomenal bench of intellectual talent. At the hub of this economy are some of the finest educational institutions in the world. When you add in the great weather compared to other west coast markets and the relatively inexpensive cost of doing business here, San Diego is well positioned to compete globally for talent and future investment. Personally, having grown up here and recently having moved back to San Diego after 5 years in Los Angeles, I love that I can surf before work and still get to the office by 8:30. San Diego’s pace of life is just the right blend of laid-back and ambitious. Within our 3 million SF San Diego portfolio, we provide space to many innovative companies. 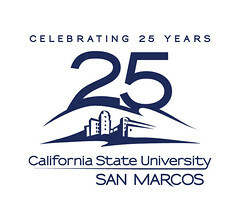 One dynamic organization that we have done business with is UCSD. The amount of innovation that they are fostering and investment they are making across almost every San Diego employment sector is immense. As an example, the Altman Research Institute and Jacobs Medical Center are part of a $2 billion building campaign, transforming health and medicine for UC San Diego and for the region. We hope to strategically increase our presence in San Diego by continuing to adjust our portfolio to reflect what we see are the changing demands in the modern workforce. Before the end of the year, we will complete The Heights Del Mar, a three-story 75,000 SF Class-A office building prominently located in one of San Diego’s largest employment centers. And as most of San Diego has seen, we hope to begin construction on One Paseo which will be a unique mixed-use community unlike anything else in the county. We are also positioning ourselves to move forward with opportunities on a few of our projects: the Horizon at Carlsbad, in Sorrento Mesa at Pacifica, Sorrento Gateway, in UTC at 9455 Towne Centre Drive, and off SR-56 adjacent to our Intuit Campus, The Meridian at Santa Fe Summit. Over the next five years, we believe that San Diego will continue to adapt in order to not only compete but also lead in areas of innovation and technology across a multitude of existing and emerging sectors. We look forward to the opportunities that come with that innovation and change. This week we sat down with CEO and founder of Innovative Commercial Environments (ICE), DeLinda Forsythe to learn more about their full service capabilities providing office and hospitality furniture. ICE provides their customers with the ideal furniture solutions. ICE is a full service hospitality and office furniture dealership. We help organizations consciously build their corporate culture. Furniture design has truly evolved and is an unconventional effective way to build your business culture. ICE plans furniture solutions that encourage a company’s staff to connect, play, solve problems together, fail, learn, grow; and ultimately “create magic.” We use furniture as a tool to build an empowered corporate culture. Inspired by “The Rainforest” book a rainforest corporate culture is not a mere business theory; it provides a new paradigm for policies and strategies that transcend the way businesses have traditionally worked. A rainforest environment in an office eliminates hierarchy and encourages teamwork. The mechanisms of a rainforest touch the heart of a company, making it more efficient and innovative. It creates an interior environment where vibrant engagement makes it possible to build a culture of inspiration. Employees working for a common goal will build an inspired company. 2) What are some advantages to being located and doing business in San Diego? I’ve been in the furniture business for 30 years, starting the first 7 years in Phoenix then San Ramon. I know how it feels to work in other cities. There is an amazing camaraderie, warmth and authenticity about San Diego. We are an intimate 1.3 million! People genuinely care and want to support each other, our charities and our homegrown companies. There is no other city I’d rather work, play and live in because of our inclusive community spirit. I started ICE from a spare bedroom 9 years ago. From those humble beginnings we’ve made the SDBJ 100 Fastest Growing Companies in San Diego the last 3 years! It is this inclusiveness that has led to our successful growth. Cybersecurity is one of the fastest growing industries and iboss Cybersecurity is one of San Diego’s fastest growing companies. According to the Deloitte Fast 500, iboss is the #3 security company with over 60+ patents and patents pending. They also have an industry-leading customer retention rate of over 98.5%. iboss’ rapid growth has fueled both domestic and international expansion. Its North American headquarters is in San Diego and they’re one to watch! I believe San Diego, along with our neighbor to the south in Tijuana, is poised for explosive growth. It is vital that we are all politically knowledgeable and engaged. It is our politicians that will lead us legislatively to grow intelligently and protect our environment. Mixed-use urban and suburban development, which reduces the need to travel, serves every demographic from our seniors to our young families and we must support these projects and adequately plan for this essential, smart growth. Everyone now knows what we’ve all known. We are one of the world’s smartest cities and we should be very proud of what we’ve created. This week we sat down with senior director at BNY Mellon, David Noosinow to learn more about what BNY Mellon has in store for the future - as they collaborate with businesses in the region, provide wealth management expertise and lead in global investment. 1) Tell us about BNY Mellon. Started by Alexander Hamilton in 1784, BNY Mellon is one of the longest-lasting financial institutions in the world. We have endured, innovated and prospered through every economic event and market in the past 230 years. We serve exceptional clients-- many of the world’s leading investors. They rely on us to connect them to opportunities in 100 markets across 35 countries. Our extraordinary people – experts in their field – make it possible. When I moved to San Diego in December of 2013 to help establish our new office in Del Mar, my primary motivation was to be close to my family, especially my daughter Averi who is in her first year at Mesa College. Before I moved to San Diego, I did not know about the breadth of industries from cyber to healthcare. And innovation is happening in every industry. In San Diego, not only will you find global leadership in life science, but also a growing technology center, cyber security, sports and active lifestyle, and let’s not forget all the great craft brewing companies on the 78 Corridor. I would be remiss if I didn’t point out one of the biggest advantages the region provides is its active lifestyle. San Diego is where innovation and lifestyle collide. 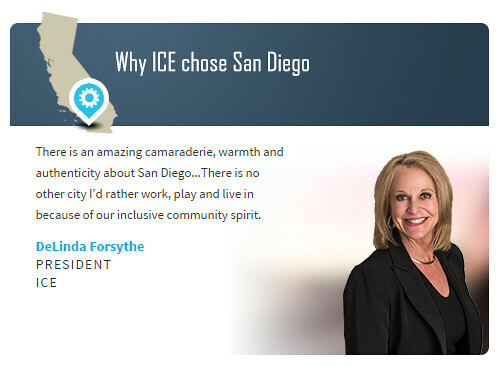 I prefer to share my thoughts on the San Diego business community: I have had the fortune to develop many markets in my career, however, I have never experienced a town where the business community and professionals are as collaborative and genuinely supportive of helping our firm establish our regional presence. In five years, I anticipate BNY Mellon will be the preeminent investment firm in San Diego; supporting innovation and the growth of the business community in the region, and the business owners and entrepreneurs that our leading the way. After watching the National Geographic’s “World’s Smart Cites” documentary about San Diego, I see the region much in the same way I see many of the startup companies in our accelerators: thriving with life and global potential. It’s a good time to be in San Diego. With more than 100,000 employees worldwide, AECOM is a global company with a strong local presence. They’ve done it all; from rebuilding Ground Zero to helping San Diego County preserve water. Not only do they work on projects that positively impact our economy, but also those that impact our social and environmental well-being. We sat down with Michael Kincaid, associate principal at AECOM in San Diego, to learn more about the company’s relationship with the region, and what’s in store for the future. People. The expertise, passion and thought leadership of our talented people around the world make our success possible. We respect and encourage our people’s ideas, diversity and cultures. Clients. We are committed to our clients and to setting industry standards for service and delivery. We take ownership for solving our clients’ problems and anticipating new opportunities. Excellence. We believe in delivering unequivocal excellence in everything we do. Integrity. We must always maintain our commitment to acting ethically and with integrity — in all that we do, every day of the year. Safety. We are a company that puts safety first. We are all accountable for keeping ourselves and our colleague’s safe, and for delivering work safely to our clients. Innovation. We differentiate our company by challenging ourselves to look for new and better ways to deliver our expertise through innovative solutions that enable each client to realize its vision. These values, which reflect the culture of AECOM, guide the future that we forge together. “Surf and sun meets innovation.” San Diego is uniquely positioned as a healthy and beautiful place to live, but also the West Coast hub of our military, the epicenter of a significant border region, and a dynamic and innovative center for business and research. World class universities, clusters of biotechnology companies, defense industry, and communications companies attract talent to San Diego. Unbeatable weather, world class beaches, parks, and countless opportunities for recreational activities keep people here. But San Diego’s advantages don’t stop there. Not only does it boast a bustling urban center promoting sustainable approaches to city living, but also preservation and careful stewardship of San Diego’s unique and precious natural resources continue to develop an environmental appreciation. Under the helm of Debra Reed, Sempra Energy is a global company pushing the envelope with sustainable fuels and renewable energy. It’s leading the way with investment in clean energy. Having recently broken ground on a new headquarters for its operations in the East Village, Sempra is leading the way in its commitment to its local community, for a safer, healthier, and environmentally more sustainable place to call home. Recognized by Fortune magazine as a World's Most Admired Company for the first time in our history, AECOM’s debut on the 2015 list is a significant accomplishment that primarily is a testament to the hard work, dedication and talent of our people around the world, who activate our vision and purpose every day. AECOM will continue to make our company even better in the months and years to come. San Diego will continue to balance growth with its needs for improved and sustainable infrastructure and infill development along with preserving its local ecosystem, not only to generate and develop economically, but ensure the quality of life for its future generations. AECOM will be a partner with San Diego to realize its vision. Qualcomm. ThermoFisher (formerly Life Technologies). BD BioSciences (formerly CareFusion). These are some of San Diego’s most globally-recognized companies. They create products and innovations that are changing the world. But that’s not the only thing they have in common: each of these companies has also worked with DLA Piper – one of San Diego’s most recognized law firms. Although DLA Piper represents companies from a variety of industries, they focus on serving San Diego’s dynamic high tech and life sciences sectors. 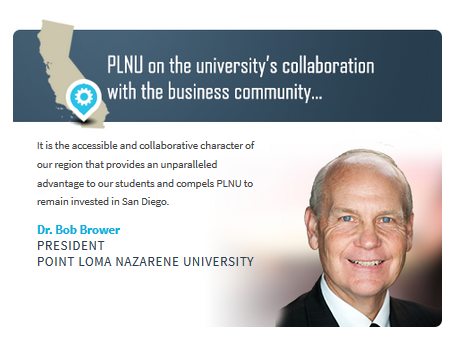 This week we spoke with Robert Brownlie, managing partner in DLA Piper San Diego, to learn more about how they interact with some of San Diego’s most prominent companies and are helping to cement the region’s global identity. 1) Tell us about DLA Piper. 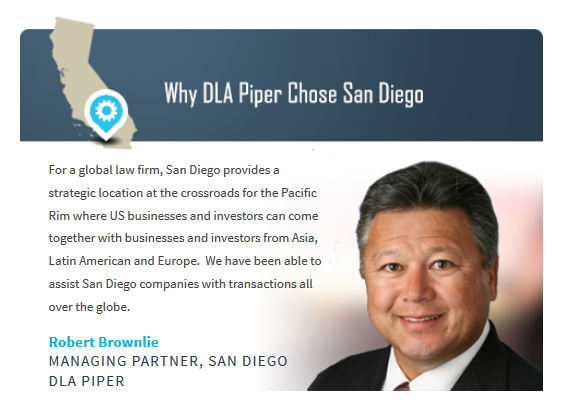 DLA Piper LLP (US) is a global law firm with deep San Diego roots. In 2005, San Diego’s Gray, Cary, Ames & Frye combined with the US firm Piper Rudnick and the international firm DLA to create DLA Piper. Our history in San Diego dates back to 1927 with the establishment of Gray Cary by Gordon Gray (a cousin of President Woodrow Wilson) and Judge William Cary. The firm quickly grew into San Diego’s largest, with a heavy emphasis on litigation and a client list including both leading San Diego-headquartered companies and Fortune 500 companies. Throughout our history, our lawyers have made a significant impact on San Diego – from Gordon Gray’s work in the founding of the San Diego Zoological Society to Jay Rains’ efforts in bringing the US Open to Torrey Pines. Today, we represent a wide range of San Diego companies, including promising startups and the region’s largest companies in multi-national deals and cases. San Diego’s location and entrepreneurial spirit provide major advantages for our practice in San Diego. For a global law firm, San Diego provides a strategic location at the crossroads for the Pacific Rim where US businesses and investors can come together with businesses and investors from Asia, Latin American and Europe. We have been able to assist San Diego companies with transactions all over the globe. Economic growth is as vital to law firms as it is to any other aspect of the economy. San Diego’s entrepreneurial spirit, fed by institutions, like UC San Diego, and visionary business leaders, provide a strong engine for economic growth to compete with other markets. We are fortunate to be positioned to assist with that growth by advising the region’s entrepreneurs and entrepreneurial companies. Qualcomm has made itself into a global leader in wireless communications. Through constant innovation, Qualcomm has managed to stay on top. It has done this through terrific leadership and a commitment to hiring and retaining the most talented individuals. It has also redefined itself seamlessly as wireless technology and the industry has evolved. Few companies anywhere have been as influential or innovative as Qualcomm. Since DLA Piper was formed, it has grown into the world’s largest law firm, with 4,200 lawyers in offices throughout the Americas, Asia Pacific, Europe and the Middle East. However, being big is not the goal. Our goal is to continue to efficiently provide top quality legal services to innovative companies locally and around the globe. The evolution of DLA’s San Diego offices are representative of that goal. For the San Diego region, we anticipate becoming more global and continuing to catalyze leading technology. The mega-region represented by San Diego County, Imperial County, and northern Baja California is a competitive advantage to addressing the increasingly global and complex business needs of our companies in our region. In addition to geography, our region will continue to lead in life sciences, wireless communications, data analytics, UAV’s, clean energy, and more. If we continue to harness these advantages, San Diego can become one of the leading regions in the world over the next 5 years. If you’ve read our blog before, then this won’t be news to you: Across the globe, the classic recipe for economic development success has evolved. A high growth and innovative region, such as San Diego, no longer spends its days nipping at the heels of large corporations, hoping incentive packages will entice them to relocate its corporate headquarters to town. They know that the majority of growth will come from cultivating innovation and helping grow existing companies. These companies have many reasons for choosing San Diego, but one item usually trumps them all: the need for smart, highly-skilled workers. Talent doesn’t just come to San Diego for then nice weather. It is also cultivated here: the region is home to some of the best universities and program in the world. However, if we want to ensure we have the workforce to compete in the global marketplace, we must engage students earlier. Joanne Pastula is one person that gets this. As the president & CEO of Junior Achievement of San Diego County, she is working to make sure more than 53,000 K-12 students throughout San Diego have the entrepreneurial and business skills to get ahead in the real world. This week, we sat down with her to learn more about how JA’s investment in students is paying dividends for our global growth plans. 1) Tell us about Junior Achievement. Look at the young people around you. Do you think they’re ready to lead America’s Finest City? San Diego’s greatest resource is the next generation of young people. It is our job to make sure they’re ready. National surveys show nearly 60 percent of today’s teens don’t think they are ready to financially support themselves by the time they turn 24. This lack of confidence is partially due to their apprehension about obtaining well-paying jobs. To ensure the region’s continued growth and competitiveness, we need to cultivate tomorrow’s professional’s right here on our home turf. That is why Junior Achievement of San Diego works locally to impact 53,000 students in K-12 classrooms each year. Our volunteer-based programs prepare kids for the real world by showing them how to get a job, start a business and how money works. Here in San Diego we have a lot to celebrate when it comes to our business environment and quality of life. Forbes recently named San Diego the No. 1 city in the United States to launch a small business in 2014. We also hold the distinction of being one of the top cities for STEM-related careers. These distinctions give JA’s students access to some of the greatest minds and companies in the nation. A great example is our collaboration with AT&T. Through our JA Job Shadow program and the AT&T Aspire grant, we impacted hundreds of students from low-income families by giving them meaningful workplace experiences. Recently, students from The Monarch School and Hoover High spent a half-a-day touring the company’s technology, sales, data and retail centers to learn about career opportunities. This partnership teaches students how to look someone in the eye, shake their hand, as well as, gain the confidence to compete for a job in our global economy. We recently partnered with The Control Group (#TCG), the developers of InstantCheckmate.com and one of the fastest growing local startup tech companies, to teach students how to code. The need for these high-tech skills is critical to the San Diego workforce. We are thankful to TCG for providing the opportunity to teach technological literacy. It highlights the wonderful work TCG does and how they are inspiring the next generation of STEM-focused career professionals. It is estimated 44 percent of millennials look at their phones more than six times an hour. We are embracing this by redeveloping curriculum onto a digital platform. Incorporating technology into student’s learning will help them make better connections, between what they learn in school, and how to apply it to the real world. There is strong projected job growth in high-tech industries in San Diego. Despite high-demand in these fields, preparation is marginalized in our K-12 education system. We must change this. Moving forward, we must do more to help our students achieve their dream outside of the classroom by giving them meaningful workplace experiences. We invite you to help us prepare and inspire San Diego’s future leaders now and for years to come.